Common Core standards have ushered in a new era of mathematics education, and with it loftier academic goals. American children are now expected to understand and articulate mathematical concepts, not just memorize and regurgitate mnemonics and procedures. 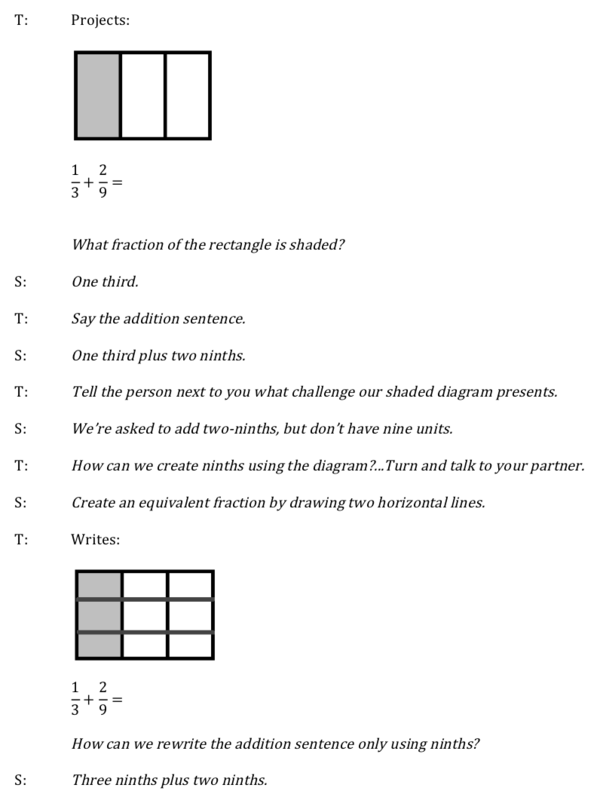 Today, unlike ten years ago, most elementary school math lessons feature conceptual models such as number bonds, place value charts, number lines, and area models. This shift has created an awareness and enthusiasm to rethink and redefine the subject. Standards and perception alone, however, will not significantly improve our populace’s mathematical competency. If the U.S. is to become a citizenry of great thinkers and reasoners, then math instruction must also change. Today, the models used to arrive at answers look drastically different than they did a generation ago. Too often, however, the teacher/student interchange does not. 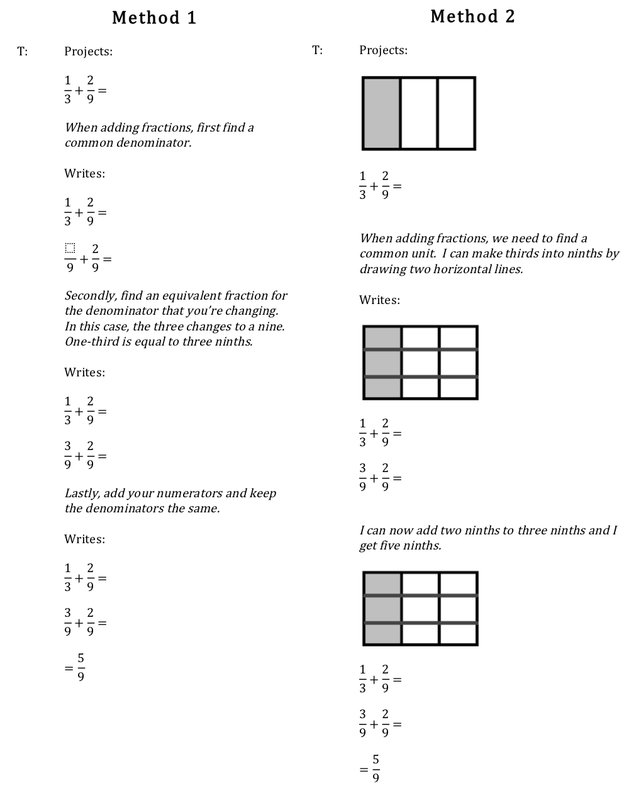 Consider two approaches to introduce Adding fractions in which one denominator changes. At first glance, the two scripts might seem different. The first is bland and abstract, while the second is visually engaging. The mode of instruction, however, is similar. Both pedagogical approaches involve a series of procedural instructions in which the teacher feeds passive learners information. When content is presented this way the benefit of the visual loses power, because students are not being directed to think and reason about the problem. Except for rules and conventions, math instruction requires very little explanation. Students are able to draw connections and make discoveries without a teacher explicitly telling them “how to do” different types of problems. In the following script, the teacher asks questions without giving any procedural instruction. The students, therefore, think and reason to make sense of the new concept. Later, the teacher might introduce a set procedure for solving. When students regularly engage in this type of instruction, their latent curiosity is aroused. They become critical thinkers, and start making better sense of the world. A more educated, enlightened citizenry emerges. Over the past ten years, American math education has made a giant leap forward. Our teachers now face the enviable burden of shiftting their instruction to reflect the subject’s nature.